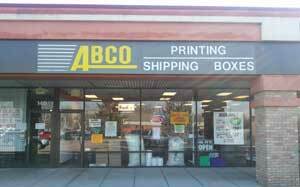 ABCO Gahanna is the one-stop resource for all of your printing, mailing and shipping needs. Conveniently located at 146 North Hamilton Road in the Rocky Fork Plaza, ABCO Gahanna is your neighborhood business service center. Our excellent history of customer satisfaction and long standing expertise in the printing, mailing and shipping affords us the ability to offer top-notch personal and business support services. Regardless if you are an individual or business owner, we at ABCO Gahanna can provide you or your business with a broad range of essentials and more! Shipping via DHL, FedEx, UPS and USPS. Printing, Copying, Shipping, and More! When you enlist ABCO Gahanna as your “personal assistant,” we will free up more time in your daily schedule by taking some of the tedious tasks off your to-do list. By teaming up with a variety of shipping companies (i.e. DHL, FedEx, UPS and USPS), you can be assured that ABCO Gahanna gives you the most shipping options. Furthermore, we offer quality packaging supplies and are dedicated to securely packing your items as if they were our own. Specializing in superior customer service since 1995! Copyright © 2012. ABCO Gahanna, LLC. All Rights Reserved.